Usually at this time of year, news is thin on the ground. Stories of how Santa fulfilled the wishes of a poor child, stories of pets that were loved or neglected over Christmas, recipes for what to do with what’s left of the turkey. This year is different. This is us all, not so much in the mouth of Christmas or New Year, as perilously close to the chomping teeth of Brexit. “Happy New Year” sounds mocking when we think about what is coming at us just three months into it. Serious efforts are being made to present black as white. One Tory MP even talked about creating ‘a glide-path’ for a hard Brexit. EH? The lies we were told before the referendum about expenditure on the NHS have now become lies about how Britannia will arise, shake off her EU chains and stride forth to forge fantastic deals with, um, well let’s just say fantastic deals.. 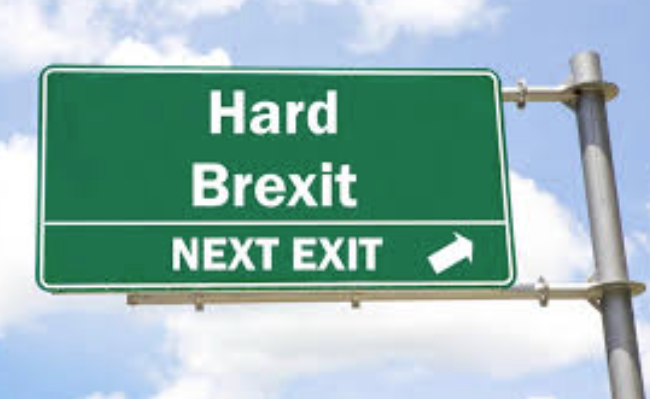 There is no such thing as a glide-path to a hard Brexit, any more than putting your hands over your face will make a difference if you jump from a tenth-storey window. Everywhere, provision is being made for a hard Brexit. The UK government is sending emails to businesses telling them…actually it’s hard to know what they’re telling them. Maybe they are two-word emails: “Brace! Brace!”. The British Defence Minister Gavin Williamson has said he’s putting 3,500 troops on stand-by “to prevent public order from deteriorating”. Comforted? Me, I’m scared. The Tanaiste Simon Coveney has said the south is preparing for the worst as well. Well, yes, Simon. That’s at least clear although blindingly obvious as well. The trouble is, once Brexit hits, it’ll be the public that’ll be faced with the challenge. The politicians will be finding ways of they’ve earned their salaries. This despite the fact that over at Westminster, they’re off on a three-week Christmas/New Year break. Maybe the hope is that such a bold move in the midst of a total disaster will put the EU into such a state of shock – these British, on a three-week break while the economic roof is about to collapse? – they’re hoping the EU will be so stupefied that Barnier and friends will agree to anything put in front of them. Alas, more likely Barnie and friends will see this as confirmation Britain is a nation of crazies. But we must try to find positives in this international clustersplat we’re all about to be caught up in. So here are the five kind of comforting thoughts I hug to my chest. Politicians and pundits are just as stupid as the rest of us. None of them saw this appalling carnage coming, and now none of them has a clue how to fix it. Britain is learning that the south of Ireland is a member of the EU. That means that their Brexit negotiations are happening with twenty-seven states, not just the puny southern state. There’s nothing so bracing as getting a bucketful of cold fact poured over your head. The economic case for a reunited Ireland is no longer a matter of dispute. There was a time when the economic benefits of unity were vague and easily swatted away by unionism. Not now. Even the DUP say they don’t want a trade border. Respectable people are now talking about a reunited Ireland. People who wear ties and pronounce their -ings. During the Troubles, many nationalists were afraid to even utter the word ‘nationalist’, for fear of being targeted by some crazies. Not now. Irish nationalism is openly acknowledged. It’s unionism that is caught in the pincer grip of, on the one side economics, and on the other side demographics. That’s why unionist yelps are becoming shriller by the day. The material hardship that a hard Brexit is bound to make may not be all bad. Over two thousand years ago, a woman was delivered of child in a stable. The boy was reared on a carpenter’s wage and didn’t He turn out good? Bliain úr faoi mhaise duit – Happy New Year.